Okay, shall we do some magic with Tomaoes? How about a kuruma? Wait, are you wondering how? Only with tomatoes? Yes, it is possible! This is going to taste too good and if you are a tomato lover, this dish is absolutely yours. For this dish, the base ingredient is fried tomatoes. 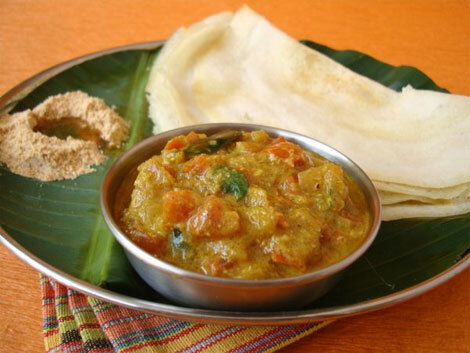 This dish is a brilliant accompaniment to Chapathi, Dhosa or Idli. Try this at home and you are going to love it like anything! Dried red chillies -3 Nos. Take a mixer jar. Take all the ingredients mentioned for the masala. Add these to the mixer jar and grind it into a smooth paste by adding little amount of water. Transfer this to a bowl and keep it aside. Take a deep bottomed pan and add gingelly oil to it. Once oil gets hot, add mustard seeds, curry leaves, and allow this to get sputtered. Now, add finely chopped onions and green chillies and saute well. It is up to you whether to add lesser or more green chillies. You may add it according to your choice of taste. Saute all of it in the oil for a few minutes until onions turn golden brown in color. While frying, make sure to keep the flame in simmer. Now, it is time to add ginger and garlic. These may either be cut to fine pieces or crushed. When you crush them and add to the Kuruma, it will give even better aroma and flavor to the entire dish. After adding ginger and garlic, give it a nice mix and fry well with the onions. As they all get fried altogether, it is time to add the tomatoes. While adding, simply smash using your hands and add. Now, this should be thoroughly cooked for at least 7 to 8 minutes. Keep stirring intermittently. As you fry, you can notice the juices from tomatoes getting oozed out slowly. And the tomatoes will get mushy. You can find a colorful yummy delight getting cooked for you! Now you should add the ground paste that you have kept aside. Add them to the pan and mix well. Now add a glass full of water and allow this mixture to get boiled for about 15 minutes in simmer flame. Keep stirring intermittently so that it doesn’t get burnt at the bottom off the pan. And now your flavorful tomato kuruma is ready to be served with idli or dhosa or chapathi of your choice. Go on and enjoy the dish served hot.